About medications that are drunk or applied to wounds it is worth learning from everyone; for people do not discover these by reasoning but by chance, and experts not more than laymen. Affections, in Hippocrates, trans. P. Potter (1988), Vol. 5, 69. Littré VI, 254. If I dared to say just what I think, I should add that it is chiefly in the service where the medication is the most active and heroic that the mortality is the greatest. Gentlemen, medicine is charlatanism. On the whole, more harm than good is done by medication. Attributed. Quoted by Oliver Wendell Holmes, 'Currents and Counter-Currents in Medical Science,', Address to the Annual Meeting of the Massachusetts Medical Society, 30 May 1860, Medical Communications of the Massachusetts Medical Society (1860), Vol. 9, 337. 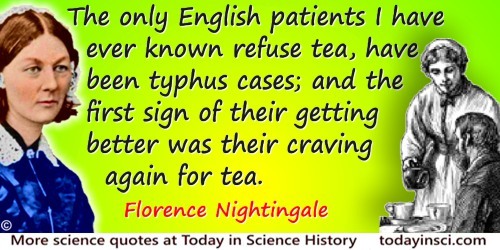 The only English patients I have ever known refuse tea, have been typhus cases; and the first sign of their getting better was their craving again for tea. 'Tea, Coffee, and Cocoa for the Sick', Scientific American (2 Jul 1860), New Series, 3, No. 1, 3. When you see the natural and almost universal craving in English sick for their 'tea,' you cannot but feel that nature knows what she is about. ... [A] little tea or coffee restores them. ... [T]here is nothing yet discovered which is a substitute to the English patient for his cup of tea.